…is now available on Amazon! Alternative Solutions to the Official SAT Practice Tests!!! 1. Learn how to manage your time. Know the layout of the test and what you need to accomplish to reach your personal best. 2. Learn the classic SAT methods: Trial and Error (where you play with each answer choice until you find the one that works) and the Back Door Play (where you replace their variables with numbers that you choose). 3. Review the math content that is actually tested. The New Math SAT Game Plan. 4. Take practice tests USING ONLY THE MOST AUTHENTIC MATERIAL AVAILABLE! Then, review each question until you understand it so well that you can explain it to someone else. The College Board’s provided solutions are always the “proper” kind. They use the algebraic methods that you use in math class. And that’s fine! You can certainly learn a lot by reading their solutions carefully. But you should also know the alternatives. Often, there are other ways to go about solving these problems — ways that the College Board never mentions! What follows here is my list of alternative solutions and shortcuts to the questions on each of those four released tests. As you go through the list, you will see some questions marked with the code DITW. That’s short for “Do it their way.” For that question, the “official” way was best. Sometimes, you just have to play by their rules. Still, I think you will be pleasantly surprised by how many times we can find another path to the answer. As more tests get released, I will post their alternative solutions as well. Also, if you see a question marked DITW, but you have found a shortcut, absolutely feel free to post a comment. If you are right, I will add your solution here. The solution methods posted here are not intended to be complete, step-by-step guides. I am just trying to give you a big push in the alternative direction. (It’s the kind of thing I do when I post on forums like the one at College Confidential.) But if you feel you need further explanation, please feel free to post questions, either here or at College Confidential. But which method is faster? Only YOU can answer that! It depends on your comfort level with algebra and whether you “see” the school method or not. So while I welcome your comments, you do not have to email me about a problem just tell me that “algebra is faster.” It may have been faster for YOU this time on this question, but maybe not for someone else – and maybe not for you either on the next question. My goal here is just to show you that for many of these problems, another path exists. I strongly recommend that you print them out and take them with paper and pencil. That is a much more realistic and effective way of practicing. Do you have any books or provide tutoring on math 2 subject tests? How realistic do you think it might be for a kid who is scoring in the mid 600’s to get to the mid 700’s just using the advice in your books? Also, we just recently purchased your 2008 edition of the New Math SAT game plan. Had not realized that there was a newer version. Is there that significant between the two books… Meaning did the problems change that much in the new SAT? Finally do you do any physics subject test tutoring? We live in Dobbs Ferry, NY, so I guess in theory it might be possible to come to you. Not sure if you ever do things by Skype? I sent you a longer email…short version: do the practice tests, review the answers, learn the alternative methods too! I am in the same position. 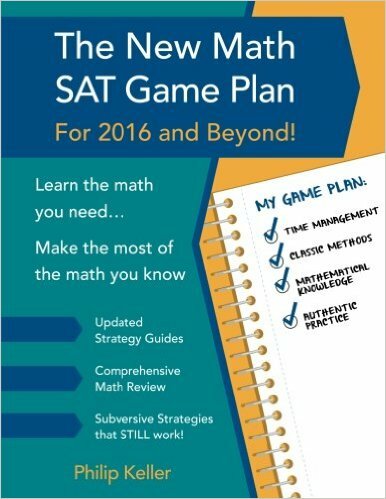 I bought the New Math SAT game plan this summer on Amazon. My daughter used it this summer, but now that I have spent some time going through it myself, I have concerns about how different it is from the new SAT math. I understand that there are no penalties for guessing, questions have fewer choices, and the easy, medium, hard order of questions no longer applies. So can we use the same game plans and just guess (since there is no penalty) or are there new plans. Also sent you an email! But I do want to say here: the questions do still get harder as you go. And depending on your strength and score goal, there does come a point where it is smart to take guesses on the remaining multiple choice questions so that you have time to pick and choose among the grid-ins. Still, let’s take care of your more individual questions by email. Perfect 800 actually! Kind of hard to believe it. Thank you. If you were a religious leader, I’d be thinking about converting right about now. That’s more than 150 pts.